The lipid peroxidation-derived aldehyde 4-hydroxynonenal (HNE) has been implicated in a number of oxidative stress-induced inflammatory pathologies such as neurodegenerative diseases and aging. In this regard, we investigated the effects of HNE on neuroinflammatory responses by measuring cyclooxygenase-2 (COX-2) and inducible nitric oxide synthase (iNOS) induction with cytokine production. In addition, we measured nuclear factor erythroid 2-related factor 2 (Nrf-2)/Kelch-like ECH-associated protein 1 (Keap1) signaling proteins, and antioxidant enzymes heme oxygenase-1 (HO-1) and nicotinamide adenine dinucleotide phosphate dehydrogenase, quinone 1 (NQO1), and compared the results with quercetin and monochloropivaloylquercetin (MPQ) pretreated microglial cells. Cytotoxicity was determined by MTT (3-(4,5-dimethylthiazol-2-yl)-2,5-diphenyltetrazolium bromide) assay and production of cytokines was determined by cytokine array. Furthermore, intracellular Nfr2/Keap1 signaling proteins, HO-1, NQO1, and COX-2 expression were analyzed by western blot in 2.5 μM HNE treated BV-2 cells. Inducible nitric oxide synthase (iNOS) and COX-2 mRNA levels were measured with reverse transcription-quantitative polymerase chain reaction. HNE induced both COX-2 mRNA and protein levels, iNOS mRNA expression, and cytokine production. In addition, HNE markedly increased Keap1 levels and decreased cytoplasmic Nrf-2 expression with antioxidant enzyme HO-1 levels. Quercetin and monochloropivaloylquercetin treatment alleviated neuroinflammatory responses in microglial cells, by decreasing COX-2 mRNA expression. 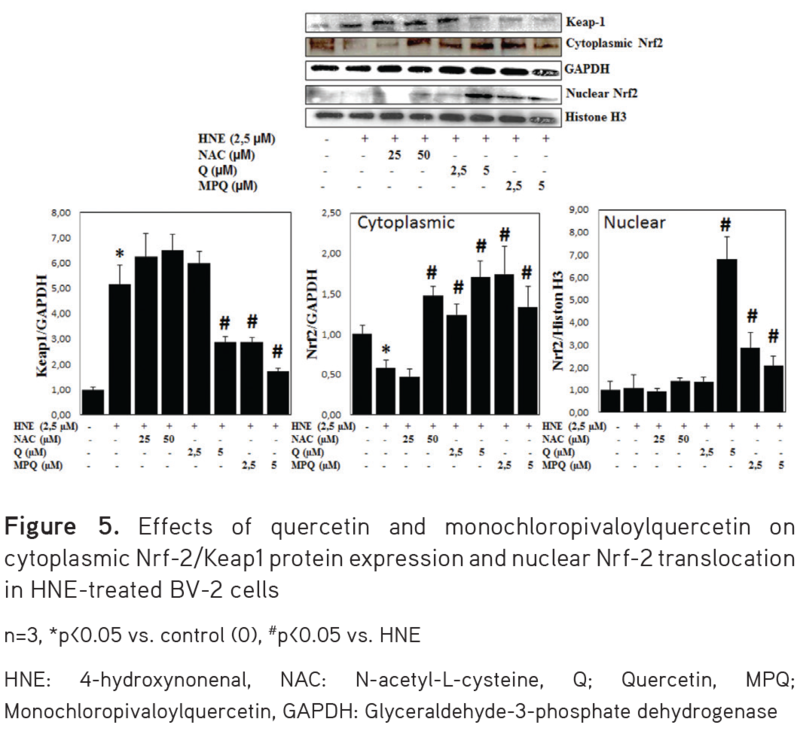 Monochloropivaloylquercetin decreased cytoplasmic Keap1 levels and increased nuclear translocation of Nrf-2 resulted in induction of HO-1 and NQO1 expression. These results suggest that HNE could be a link between oxidative stress and inflammation in BV-2 microglia cells. In particular, monochloropivaloylquercetin alleviated inflammation, probably by decreasing the expression of proinflammatory genes and strengthening the antioxidant defense system. Flavonoids comprise a large group of compounds occurring widely throughout the plant kingdom and exert several biological activities, which are mainly related to their antioxidant properties,18 and they are able to regulate immune responses.19 Quercetin is the most common flavonoid in nature and fruits and vegetables, especially berries and onions, are the primary sources of naturally occurring dietary quercetin derivatives. Quercetin bioavailability is generally poor and characterized by high intersubject variability.20 To find new analogues with increased bioavailability and enhanced pharmacological activity, researchers have attempted the chemical modification of quercetin. In the present study, we aimed to investigate the influence of HNE-mediated oxidative stress on the induction of inflammatory response in BV-2 (mouse microglia cells) and present some emerging therapeutic options for antioxidant/anti-inflammatory therapy, together with the therapeutic potential of quercetin and monochloropivaloylquercetin. BV-2 mouse microglial cells were kindly donated by Lucia Rackova PhD (Slovak Academy of Sciences, Slovakia). The cells were cultured in either 75 cm2 flasks or 6-well dishes containing Dulbecco’s Modified Eagle Medium (DMEM) supplemented with 10% fetal bovine serum (FBS), 2 mM glutamine, 100 U/mL penicillin, and 10 µg/mL streptomycin and grown in a 5% CO2 atmosphere at 37°C. The cytotoxic effect of HNE was evaluated by MTT (3-[4,5-dimethylthiazol-2-yl]-2,5 diphenyl tetrazolium bromide) reduction assay. BV-2 cells were treated with 0-50 µM of HNE without phenol red 1% FBS supplemented DMEM for 6 h and then rinsed three times with ice-cold phosphate-buffered saline (PBS). MTT was added to the final concentration of 0.5 mg/mL. After 4 h of MTT incubation, solubilization buffer (10% sodium dodecyl sulfate in 0.01 mol/L HCl) was added and the colored formazan crystals were gently resuspended. The absorbance at 570 nm was recorded with a microplate reader (Bio-Tek ELX800, BioTek Instruments Inc., Winooski, VT, USA). Cells were pretreated with N-acetyl-L-cysteine (Sigma-Aldrich, St. Louis, MO, USA), quercetin (Sigma-Aldrich), and monochloropivaloylquercetin (indicated concentrations for 3 h) and treated with HNE (2.5 µmol/L, 6 h). After the treatment procedure the cells were washed in ice cold PBS three times and lysed in radio immunoprecipitation assay buffer supplemented with 2 mM Na3VO4 and protease inhibitor cocktail (Complete MiniTM, Roche, Mannheim, Germany) at 4°C. The lysate was clarified by centrifugation at 10,000 rpm for 10 min at 4°C to remove insoluble components. We used Ne-PER (Pierce, Rockford, IL, USA) nuclear and cytoplasmic extraction reagents to prepare fractions according to the manufacturer’s instructions. Cell lysates were normalized for protein content using bicinchoninic acid assay reagent (Pierce). Equal amounts (30 µg) of protein were loaded onto 10% PAGE gels and separated by standard SDS-PAGE procedure. Proteins were transferred to a polyvinylidene difluoride membrane (Bio-Rad, Hercules, CA, USA) and blocked with 5% nonfat dry milk in TBST. To detect protein expression, the blots were probed with the specific antibodies against HO-1, Keap1, Nrf-2 (Bioss, Woburn, MA, USA), COX-2 (Santa Cruz Biotechnology, Santa Cruz, CA, USA), and NQO1 (Abcam, Cambridge, MA, USA) followed by the secondary antibodies coupled to horseradish peroxidase. The detection of GAPDH (Cell Signaling Technology Inc., Beverly, MA, USA) with a specific antibody was used as an internal control. The immunoreactive proteins on the membrane were detected by chemiluminescence using the SuperSignal® West Pico (Pierce) on X-ray film. Total RNA isolation from cells was performed via phenol-guanidine thiocyanate extraction using RNAzol isolation reagent (Sigma-Aldrich), according to the manufacturer’s instructions. Total RNA (1 µg) was reverse-transcribed to cDNA using a Transcriptor High Fidelity cDNA Synthesis Kit (Roche) in a 20 µL reaction mixture. Real-time polymerase chain reaction (PCR) was carried out using a LightCycler Nano System (Roche). To quantify cDNA, qPCR was performed using FastStart Essential DNA probe master mix (Roche). The reaction mixture (15 µL) was prepared in LightCycler 8-tube strips (Roche) and included 10 µL of 2´ Master Reaction Mix (Roche), 4 µL of PCR grade water, 1 µL of catalogue assay kit (kits consist mix of primers and probes for determination of iNOS, COX-2, β-actin), and 5 µL of cDNA. Real-time PCR was performed according to the following conditions: activation of Taq DNA polymerase and DNA denaturation at 95°C for 10 min, followed by 45 amplification cycles for 10 s at 95°C and for 30 s at 60°C. For each sample the level of target gene transcripts was normalized to β-actin. BV-2 cells (1×106) were treated with HNE (2.5 µmol/L, 6 h) and the released cytokines were determined semiquantitatively by mouse cytokine antibody array (Abcam) according to the manufacturer’s protocol. The density of the cytokine spots was analyzed by using the ImageJ densitometric analysis program. We used the intensity of positive control spots for normalization of array results. Possible associations between groups were analyzed with SigmaPlot 12 statistical software using the t test. P values <0.05 were considered statistically significant. Fold increases or decreases in mRNA levels were also calculated by relative expression software tool developed for group-wise comparison and statistical analysis of relative expression results. Firstly, we investigated the cytotoxic activity of HNE in BV-2 cells. As shown in Figure 1, HNE dose-dependently triggered cell death. After 6 h of incubation, HNE significantly reduced the viability of cultured microglial cells at the conc. 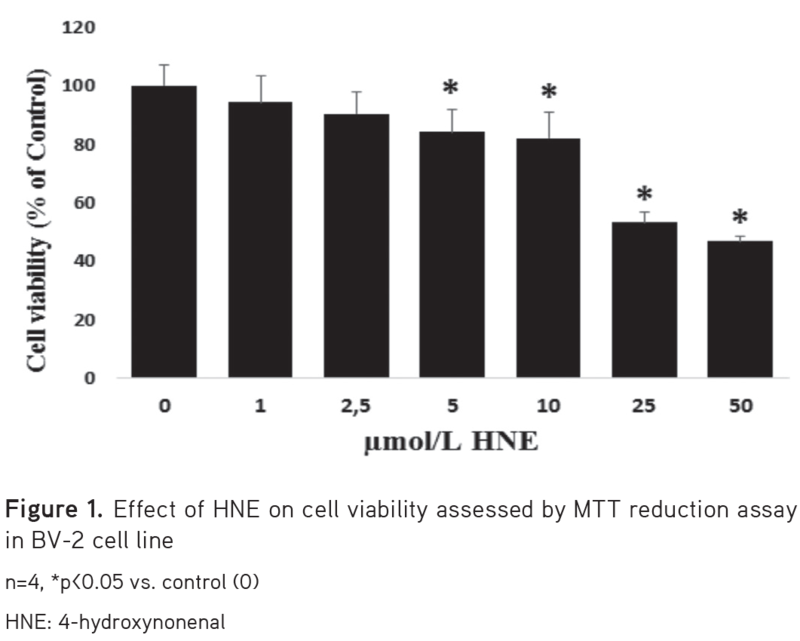 >2.5 µmol/L, whereas 2.5 µmol/L or lower concentrations of HNE decreased cultured cell viability, but the differences were not statistically significant. The nontoxic highest concentration of HNE was used for induction of neuroinflammation. Quercetin and monochloropivaloylquercetin were toxic over 10 µM (data not shown). Thus, for all the further studies these nontoxic doses of quercetin and monochloropivaloylquercetin were used, ranging from 2.5 to 5.0 µM. We then examined the inflammatory effect of HNE on cytokine production in BV-2 cells. A mouse cytokine antibody array was applied to broadly observe the effects of HNE on cytokine secretion. 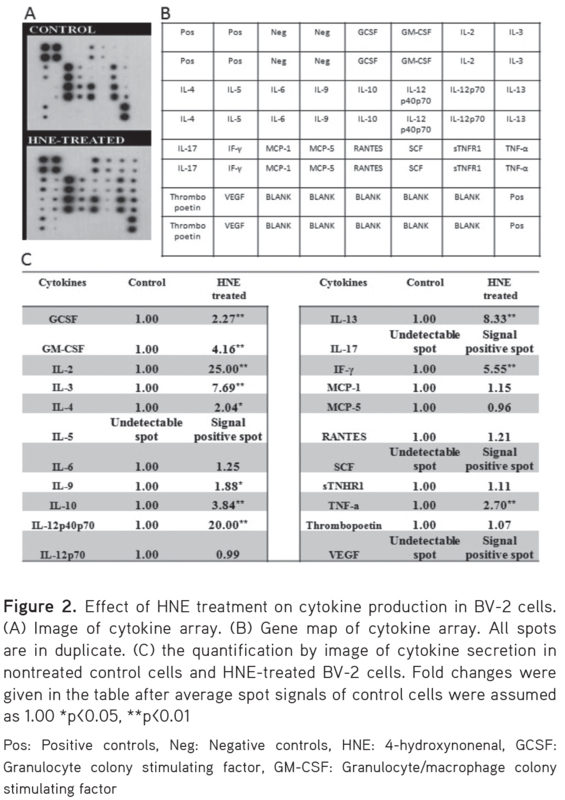 After the cells were incubated with HNE for 6 h, the cytokine expression pattern in the treated cells was differentially compared to that in the control cells (Figure 2). According to the array results, under basal conditions (in control cells), IL-5, IL-17, SCF, and VEGF protein expressions were at undetectable levels After HNE treatment, cytokine protein expressions of granulocyte colony stimulating factor, granulocyte/macrophage colony stimulating factor, IL-2, IL-3, IL-4, IL-5, IL-9, IL-10, IL-13, IL-17, IF-γ, SCF, p60/p70, VEGF, and TNF-α all were increased. Expressions of IL-6, RANTES, MCP-1, and sTNHR1 were slightly increased in HNE-treated cells, compared to those of the untreated group. IL-12p70, MCP-5, and thrombopoietin expression patterns did not change in HNE-treated cells, when compared with those of the untreated group. After BV-2 cells were exposed to HNE for 0, 1, 3, 6, and 12 h, we performed mRNA and protein expression analysis of the COX-2 and mRNA expression of iNOS. 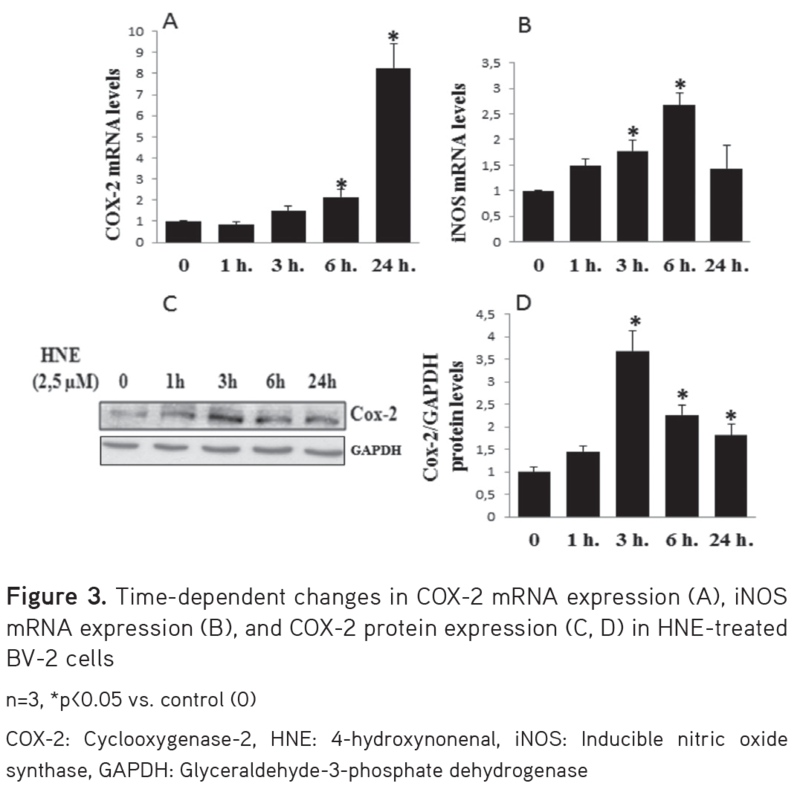 Real-time PCR analysis confirmed that there was a time-dependent increase in the expressions of COX-2 and inducible nitric oxide synthase (iNOS) in the HNE-treated BV-2 cells compared with the control (Figure 3). In parallel to these results, HNE exposure increased COX-2 protein expression. Although pretreatment with quercetin and monochloropivaloylquercetin did not affect iNOS mRNA expression in HNE-treated BV-2 cells, monochloropivaloylquercetin pretreatment significantly decreased COX-2 mRNA expression (Figure 4). It is known that the redox-sensitive transcription factor Nrf-2 plays an important role in cellular defense against oxidative stress by inducing the expression of phase II genes (Figure 5). Western blot analysis was performed to determine the cytoplasmic expression and nuclear translocation of Nrf-2 in response to 2.5 µmol/L HNE, quercetin, and monochloropivaloylquercetin. Although HNE did not cause any nuclear translocation of Nrf-2 at 6 h, it increased the cytoplasmic expression of Keap1 and decreased the cytoplasmic expression of Nrf-2. In addition, HNE treatment caused a slight alteration in HO-1 and NQO1 expression but the difference was not statistically significant (Figure 6). Pretreatment with quercetin and monochloropivaloylquercetin markedly decreased cytoplasmic Keap1 levels with increased cytoplasmic Nrf-2 levels. At the same time, monochloropivaloylquercetin pretreatment induced expression of the antioxidant proteins HO-1 and NQO1, while quercetin pretreatment induced NQO1 expression with both molecules increased nuclear translocation of Nrf-2. The aim of this study was firstly to test the effect of mild-type oxidative/electrophilic stress on neuro-inflammatory response in microglial cells induced by HNE, and secondly to investigate the protective ability of quercetin and monochloropivaloylquercetin. We found that HNE induced inflammatory response by increasing both COX-2 mRNA and protein expression as well as iNOS mRNA levels in a time-dependent manner and augmenting cytokine production. Quercetin and monochloropivaloylquercetin exerted a significant antioxidant effect by strengthening the antioxidant defense system via induced nuclear translocation of Nrf-2 and decreased Keap1 expression in addition to increased NQO1. Additionally, monochloropivaloylquercetin induced HO-1 expression and behaved as an anti-neuroinflammatory agent by decreasing COX-2 expression against HNE-induced inflammatory in BV-2 cells. The goal of the present study was to identify whether HNE is a possible intracellular mediator between oxidative stress and inflammation in microglia cells. Our results reveal that oxidative stress is an iNOS and COX-2 activator in BV-2 microglia cells. Indeed, COX-2 expression was significantly increased and similarly release of proinflammatory cytokines was significantly raised in response to HNE-mediated oxidative stress. Previous studies have reported that 4-HNE is an inducer of COX-2 expression in several types of cells including 3T3-L1 adipocytes,36 epithelial RL34 cells,37 and macrophages.38 Our data extend these results to BV-2 microglia cells. Given that lipid peroxidation reactions are an important source of advanced glycation end products (AGEs),39 the production of lipid peroxidation-derived aldehyde fragments such as HNE may indicate a mechanism by which AGE epitopes are generated. Other than HNE, advanced lipid peroxidation end products induced proinflammatory response by activating proinflammatory gene expression in monocytes.40 In addition, activation of the receptor for advanced glycation end product mediated pathway on mononuclear phagocytes has been reported to give rise to this phenotype of activated macrophages that is manifested by the induction of some proinflammatory cytokines (IL-1 β and TNF-α), platelet-derived growth factor, and insulin-like growth factor-1. Moreover, it was emphasized in these studies that HNE is a possible link between oxidative stress and inflammation. Our results are also in agreement with those published by Kauppinen et al.41 who reported that 24-h HNE treatment induced inflammasome signaling by increased inflammasome component NRLP3 (NLR family, pyrin domain containing 3) mRNA levels in retinal pigment epithelial cells (ARPE-19), raising the IL-1 β and IL-18 release. Additionally, the inflammatory role of HNE was reported by Chen et al.42, who stated that single treatment with 10 µM HNE induced proinflammatory prostaglandin E2 (PGE2) release as well as COX-2 and microsomal PGE2 synthase-1 (mPGES-1) expression in osteoarthritic chondrocytes. Another key piece of evidence for the inflammatory effect of HNE was that HNE may contribute to osteoarthritis development via its ability to alter cellular phenotype and metabolic activity of osteoblasts by modulating inflammatory processes. HNE induced PGE2 release and COX-2 expression and COX-2 promoter activity with activated MAPK signaling pathway in osteoblasts.43 Although quercetin and its derivatives have been shown to have anti-inflammatory and antioxidant effects in several in vivo and in vitro studies, the effect of a new quercetin derivative monochloropivaloylquercetin on the HNE-stimulated activation of inflammatory COX-2 expression and Nrf-2/HO-1 and NQO1 antioxidant signaling pathway, which may be involved in the neuroinflammation and immune response, has not been studied before. Nrf-2 is sequestered in the cytoplasm with its cytosolic repressor Keap1. The dissociation of Nrf-2 from Keap1 is crucial for its nuclear translocation, followed by binding to the ARE.44 The innate immune response involves generation of ROS, which can act as second messengers activating proinflammatory signaling pathways such as NFkB.45 Accordingly, inhibition of NFkB and herewith activation of the Nrf-2 signaling pathway may be a beneficial strategy for reduction of the deleterious effects of inflammation and it is well known that anti-inflammatory agents suppress NFkB signaling while activating the Nrf-2/ARE pathway.46-48 Activation of the Nrf-2 mediated signaling pathway results in upregulation of HO-1 expression. HO-1 is known to play an anti-inflammatory role due to carbon monoxide production and NFkB inhibition.49 In our study, pretreatment with quercetin and monochloropivaloylquercetin activated Nrf-2/Keap1 signaling by decreasing cytoplasmic expression and inducing nuclear translocation of Nrf-2, resulting in upregulation of downstream genes HO-1 and NQO1 in HNE-treated BV-2 cells. Additionally, COX-2 mRNA stimulation by 4-HNE was inhibited when BV-2 cells were preincubated with quercetin and monochloropivaloylquercetin. In this regard, there remains the possibility that induction of Nrf-2 target genes contributes to both quercetin and monochloropivaloylquercetin’s efficacy to inhibit COX-2 expression. Ramyaa et al.50 have already reported the modulatory effect of quercetin on oxidative stress by upregulating Nrf-2 expression and downregulating NFkB and COX-2 expression. 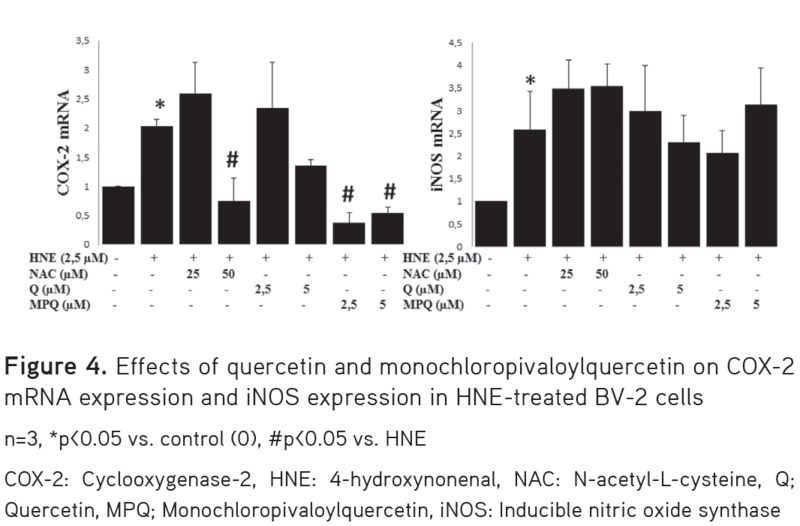 The anti-inflammatory properties of quercetin accompanied by an increase in HO-1 protein levels associated with elevated nuclear translocation of Nrf-2 were previously exhibited by Boesch-Saadatmandi et al.51 in murine RAW 264.7 macrophages. On the other hand, quercetin acts as an anti-inflammatory agent in lipopolysaccharide-induced acute lung injury by significantly reducing COX-2 and iNOS expression, and NFkB p65 phosphorylation.52 In another study, intratracheal administration of quercetin affected the protective agent by modulating HO-1 activity against lipopolysaccharide-induced acute lung injury.53 Quercetin was previously shown to downregulate proinflammatory responses, involving iNOS expression and NO generation in BV-2 cells through inducing Nrf-2 mediated HO-1 expression.54 In contrast, quercetin pretreatment did not affect iNOS mRNA expression in our study; this may be associated with the dose of quercetin or incubation time. Our data provide new evidence for the inflammatory role of HNE, an oxidative stress-related product, in the physiopathology of neuro-inflammation and we propose that the activation of the Nrf-2/HO-1 pathway by quercetin and monochloropivaloylquercetin may mediate its anti-inflammatory properties. 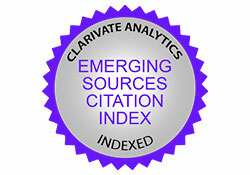 This article was part of the master’s thesis by Zehra Özkul. Esterbauer H, Schaur RJ, Zollner H. Chemistry and biochemistry of 4-hydroxynonenal, malonaldehyde and related aldehydes. Free Radic Biol Med. 1991;11:81-128. Schaur, RJ. Basic aspects of the biochemical reactivity of 4-hydroxynonenal. Mol Aspects Med. 2003;24:149-159. Yan LJ. Positive oxidative stress in aging and aging-related disease tolerance. Redox Biol. 2014;2:165-169. Zarkovic K. 4-hydroxynonenal and neurodegenerative diseases. Mol Aspects Med. 2003;24:293-303. Csala M, Kardon T, Legeza B, Lizák B, Mandl J, Margittai É, Puskás F, Száraz P, Szelényi P, Bánhegyi G. On the role of 4-hydroxynonenal in health and disease. Biochim Biophys Acta. 2015;1852:826-838. Sayre LM, Zelasko DA, Harris PL, Perry G, Salomon RG, Smith MA. 4-Hydroxynonenal-derived advanced lipid peroxidation end products are increased in Alzheimer’s disease. J Neurochem. 1997;68:2092-2097. Drake J, Petroze R, Castegna A, Ding Q, Keller JN, Markesbery WR, Lovell MA, Butterfield DA. 4-Hydroxynonenal oxidatively modifies histones: implications for Alzheimer’s disease. Neurosci Lett. 2004;356:155-158. Lovell MA, Ehmann WD, Mattson MP, Markesbery WR. Elevated 4-hydroxynonenal in ventricular fluid in Alzheimer’s disease. Neurobiol Aging. 1997;18:457-461. Markesbery WR, Lovell MA. Four-hydroxynonenal, a product of lipid peroxidation, is increased in the brain in Alzheimer’s disease. Neurobiol Aging. 1998;19:33-36. Halliwell B. Oxidative stress and neurodegeneration: where are we now? J Neurochem. 2006;97:1634-1658. Liu B, Hong JS. Role of microglia in inflammation-mediated neurodegenerative diseases: mechanisms and strategies for therapeutic intervention. J Pharmacol Exp Ther. 2003;304:1-7. Rojo AI, McBean G, Cindric M, Egea J, López MG, Rada P, Zarkovic N, Cuadrado A. Redox control of microglial function: molecular mechanisms and functional significance. Antioxid Redox Signal. 2014;21:1766-1801. Suzumura A. Neuron-microglia interaction in neuroinflammation. Curr Protein Pept Sci. 2013;14:16-20. Gopal S, Mikulskis A, Gold R, Fox RJ, Dawson KT, Amaravadi L. Evidence of activation of the Nrf2 pathway in multiple sclerosis patients treated with delayed-release dimethyl fumarate in the Phase 3 DEFINE and CONFIRM studies. Mult Scler. 2017;23:1875-1883. Venugopal R, Jaiswal AK. Nrf1 and Nrf2 positively and c-Fos and Fra1 negatively regulate the human antioxidant response element-mediated expression of NAD(P)H:quinone oxidoreductase1 gene. Proc Natl Acad Sci USA. 1996;93:14960-14965. Itoh K, Wakabayashi N, Katoh Y, Ishii T, Igarashi K, Engel JD, Yamamoto M. Keap1 represses nuclear activation of antioxidant responsive elements by Nrf2 through binding to the amino-terminal Neh2 domain. Genes Dev. 1999;13:76-86. O’Banion MK. Cyclooxygenase-2: molecular biology, pharmacology, and neurobiology. Crit Rev Neurobiol. 1999;13:45-82. Kozłowska A, Szostak-Wegierek D. Flavonoids food sources and health benefits. Rocz Państw Zakł Hig. 2014;65:79-85. Middleton E Jr, Kandaswami C. Effects of flavonoids on immune and inflammatory cell functions. Biochem Pharmacol. 1992;43:1167-1179. Guo Y, Bruno RS. Endogenous and exogenous mediators of quercetin bioavailability. J Nutr Biochem. 2015;26:201-210. Veverka M, Gallovic J, Svaidlenka E, Veverkova E, Pronavova N, Milackova I, Stefek M. Novel quercetin derivatives: synthesis and screening for anti-oxidant activity and aldose reductase inhibition. Chemical Papers. 2013;67:76-83. Žižková P, Blaškovič D, Májeková M, Švorc L, Račková L, Ratkovská L, Veverka M, Horáková L. Novel quercetin derivatives in treatment of peroxynitrite-oxidized SERCA1. Mol Cell Biochem. 2014;386:1-14. Mrvová N, Škandík M, Kuniaková M, Račková L. Modulation of BV-2 microglia functions by novel quercetin pivaloyl ester. Neurochem Int. 2015;90:246-254. Bradley MA, Xiong-Fister S, Markesbery WR, Lovell MA. Elevated 4-hydroxyhexenal in Alzheimer’s disease (AD) progression. Neurobiol Aging. 2012;33:1034-1044. Williams TI, Lynn BC, Markesbery WR, Lovell MA. Increased levels of 4-hydroxynonenal and acrolein, neurotoxic markers of lipid peroxidation, in the brain in Mild Cognitive Impairment and early Alzheimer’s disease. Neurobiol Aging. 2006;27:1094-1099. Yoritaka A, Hattori N, Uchida K, Tanaka M, Stadtman E, Mizuno Y. Immunohistochemical detection of 4-hydroxynonenal protein adducts in Parkinson disease. Proc Natl Acad Sci USA. 1996;93:2696-2701. Hsieh HL, Yang CM. Role of redox signaling in neuroinflammation and neurodegenerative diseases. Biomed Res Int. 2013;2013:484613. Min KJ, Yang MS, Kim SU, Jou I, Joe EH. Astrocytes induce hemeoxygenase-1 expression in microglia: a feasible mechanism for preventing excessive brain inflammation. J Neurosci. 2006;26:1880-1887. Melo A, Monteiro L, Lima RM, Oliveira DM, Cerqueira MD, El-Bachá RS. Oxidative stress in neurodegenerative diseases: mechanisms and therapeutic perspectives. Oxid Med Cell Longev. 2011;2011:467180. Adibhatla RM, Hatcher JF. Lipid oxidation and peroxidation in CNS health and disease: from molecular mechanisms to therapeutic opportunities. Antioxid Redox Signal. 2010;12:125-169. Siems W, Grune T. Intracellular metabolism of 4-hydroxynonenal. Mol Aspects Med 2003;24:167-175. 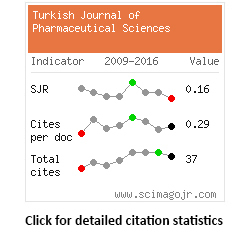 Wildburger R, Mrakovcic L, Stroser M, Andrisic L, Borovıc Sunjıc S, Zarkovıc K, Zarkovıc N. Lipid peroxidation and age-associated diseases cause or consequence? Türkiye Klinikleri J Med Sci. 2009;29:189-193. Milkovic L, Cipak Gasparovic A, Zarkovic N. Overview on major lipid peroxidation bioactive factor 4-hydroxynonenal as pluripotent growth-regulating factor. Free Radic Res. 2015;49:850-860. Cumaoglu A, Arıcıoglu A, Karasu C. Redox status related activation of endoplasmic reticulum stress and apoptosis caused by 4-hydroxynonenal exposure in INS-1 cells. Toxicol Mech Methods. 2014;24:362-367. Bali EB, Ergin V, Rackova L, Bayraktar O, Küçükboyaci N, Karasu C. Olive leaf extracts protect cardiomyocytes against 4-hydroxynonenal-induced toxicity in vitro: comparison with oleuropein, hydroxytyrosol, and quercetin. Planta Med. 2014;80:984-992. Zarrouki B, Soares AF, Guichardant M, Lagarde M, Géloën A. The lipid peroxidation end-product 4-HNE induces COX-2 expression through p38MAPK activation in 3T3-L1 adipose cell. FEBS Lett. 2007;581:2394-2400. Uchida K, Kumagai T. 4-hydroxy-2-nonenal as a COX-2 inducer. Mol Aspects Med. 2003;24:213-218. Kumagai T, Matsukawa N, Kaneko Y, Kusumi Y, Mitsumata M, Uchida K. A lipid peroxidation-derived inflammatory mediator: identification of 4-hydroxy-2-nonenal as a potential inducer of cyclooxygenase-2 in macrophages. J Biol Chem. 2004;279:48389-48396. Fu MX, Requena JR, Jenkins AJ, Lyons TJ, Baynes JW, Thorpe SR. The advanced glycation end product, Ne- (carboxymethyl)lysine, is a product of both lipid peroxidation and glycoxidation reactions. J Biol Chem. 1996;271:9982-9986. Shanmugam N, Figarola JL, Li Y, Swiderski PM, Rahbar S, Natarajan R. Proinflammatory effects of advanced lipoxidation end products in monocytes. Diabetes. 2008;57:879-888. Kauppinen A, Niskanen H, Suuronen T, Kinnunen K, Salminen A, Kaarniranta K. Oxidative stress activates NLRP3 inflammasomes in ARPE-19 cells implications for age-related macular degeneration (AMD). Immunol Lett. 2012;147:29-33. Chen SH, Fahmi H, Shi Q, Benderdour M. Regulation of microsomal prostaglandin E2 synthase-1 and 5-lipoxygenase-activating protein/5-lipoxygenase by 4-hydroxynonenal in human osteoarthritic chondrocytes. Arthritis Res Ther. 2010;12:21. Shi Q, Vaillancourt F, Côté V, Fehmi H, Lavigne P, Afif H, Di Battista JA, Fernandes JC, Benderdour M. Alterations of metabolic activity in human osteoarthritic osteoblasts by lipid peroxidation end product 4-hydroxynonenal. Arthritis Res Ther. 2006;8:159. Zenkov NK, Menshchikova EB, Tkachev VO. Keap1/Nrf2/ARE redox-sensitive signaling system as a pharmacological target. Biochemistry (Mosc). 2013;78:19-36. Morgan MJ, Liu ZG. Crosstalk of reactive oxygen species and NF-κB signaling. Cell Res. 2011;21:103-115. Wagner AE, Boesch-Saadatmandi C, Dose J, Schultheiss G, Rimbach G. Anti-inflammatory potential of allyl-isothiocyanate role of Nrf2, NF-(κ) B and microRNA-155. J Cell Mol Med. 2012;16:836-843. Manandhar S, You A, Lee ES, Kim JA, Kwak MK. Activation of the Nrf2-antioxidant system by a novel cyclooxygenase-2 inhibitor furan-2-yl-3-pyridin-2-yl-propenone: implication in anti-inflammatory function by Nrf2 activator. J Pharm Pharmacol. 2008;60:879-887. Yao J, Zhao L, Zhao Q, Zhao Y, Sun Y, Zhang Y, Miao H, You QD, Hu R, Guo QL. NF-κB and Nrf2 signaling pathways contribute to wogonin-mediated inhibition of inflammation-associated colorectal carcinogenesis. Cell Death Dis. 2014;5:1283. Bellezza I, Tucci A, Galli F, Grottelli S, Mierla AL, Pilolli F, Minelli A. Inhibition of NF-κB nuclear translocation via HO-1 activation underlies α-tocopheryl succinate toxicity. J Nutr Biochem. 2012;23:1583-1591. Ramyaa P, Krishnaswamy R, Padma VV. Quercetin modulates OTA-induced oxidative stress and redox signalling in HepG2 cells - up regulation of Nrf2 expression and down regulation of NF-κB and COX-2. Biochim Biophys Acta. 2014;1840:681-692. Boesch-Saadatmandi C, Loboda A, Wagner AE, Stachurska A, Jozkowicz A, Dulak J, Döring F, Wolffram S, Rimbach G. Effect of quercetin and its metabolites isorhamnetin and quercetin-3-glucuronide on inflammatory gene expression: role of miR-155. J Nutr Biochem. 2011;22:293-299. Wang L, Chen J, Wang B, Wu D, Li H, Lu H, Wu H, Chai Y. Protective effect of quercetin on lipopolysaccharide-induced acute lung injury in mice by inhibiting inflammatory cell influx. Exp Biol Med (Maywood). 2014;239:1653-1662. Takashima K, Matsushima M, Hashimoto K, Nose H, Sato M, Hashimoto N, Hasegawa Y, Kawabe T. Protective effects of intratracheally administered quercetin on lipopolysaccharide-induced acute lung injury. Respir Res. 2014;15:150. Kang CH, Choi YH, Moon SK, Kim WJ, Kim GY. 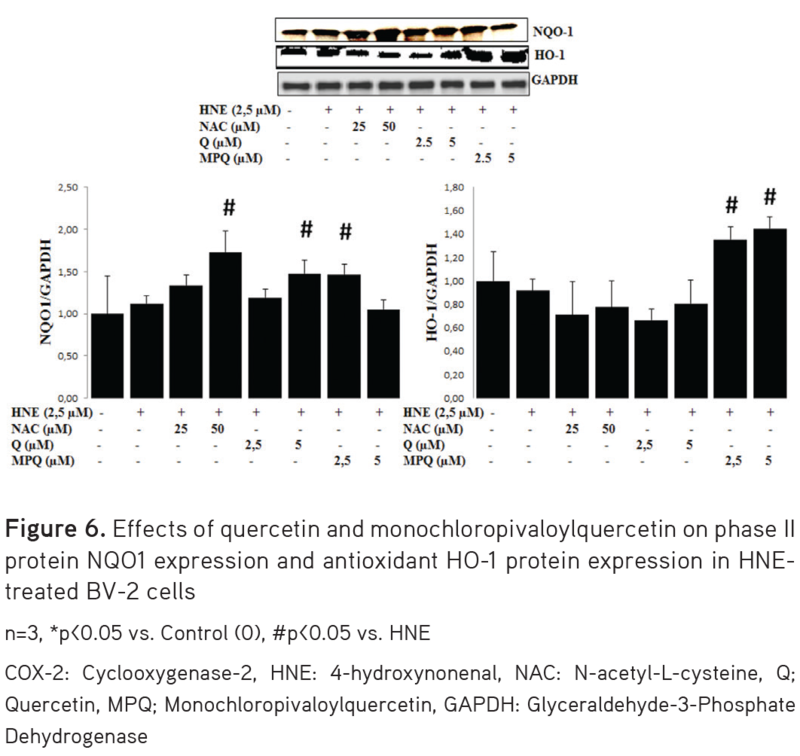 Quercetin inhibits lipopolysaccharide-induced nitric oxide production in BV2 microglial cells by suppressing the NF-κB pathway and activating the Nrf2-dependent HO-1 pathway. Int Immunopharmacol. 2013;17:808-813.